What is Periodic Limb Movement Disorder (PLMD) and How is it Treated? Have you been told by your bedpartner that your legs move frequently while you sleep? Have you noticed that you're feeling tired during the day, even after you've had a full night's sleep? If so, it's possible that you may be suffering from periodic limb movement disorder (PLMD). Periodic limb movement disorder is a sleep disorder in which a person experiences periodic, involuntary movements of their legs (and sometimes other limbs) during their sleep. These movements are often described as twitches, spasms, jerks, or flexing of the legs and feet muscles. The movements last for approximately 1-5 seconds at a time and recur every 5-90 seconds. These movements often cluster together at periodic intervals throughout the first part of non-REM sleep, and can last anywhere from a few minutes to a few hours. Severity of symptoms can also vary from night to night. PLMD does not occur during REM sleep because of muscle atonia during this phase of sleep, during which the body is paralyzed to prevent people from acting out their dreams. Many patients suffering from PLMD experience other symptoms as well including excessive daytime sleepiness (EDS), chronic insomnia, and restless leg syndrome (RLS). Scientists are still trying to determine what exactly causes PLMD. 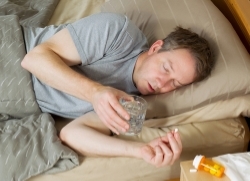 However, while the exact causes are not known, there are many indicators that have been identified that may contribute to PLMD or exacerbate the symptoms such as Parkinson's disease, narcolepsy, sleep apnea, use of hypnotics, drug dependency, antidepressant withdrawal, iron deficiency, caffeine use, and spinal cord injury. PLMD is sometimes seen as an indicator of other serious medical problems such as Parkinson's disease, kidney disease, diabetes, and anemia. PLMD is believed to prevalent in roughly 4-11% of adults, although it is more common in elderly women. PLMD is frequently a symptom of restless leg syndrome (RLS). Approximately 80% of patients with RLS have PLMD. However, while having RLS is a strong indication that a patient will also have PLMD, having PLMD is not a strong indicator of having RLS. How is PLMD different from RLS? Patients with periodic limb movement disorder often aren't even aware of the disorder as the leg movements occur involuntarily during their sleep. Patients with restless leg syndrome move their legs voluntarily to relieve feelings of discomfort that are often described as pulling, throbbing, itching, creeping, or other uncomfortable sensations. These symptoms manifest themselves during periods of rest such as when going to bed and the only temporary relief from the discomfort is to move the legs. For a more in-depth look at the relationship between RLS and PLMD click here. In many cases where excessive daytime sleepiness and chronic insomnia are not present, treatment is not often necessary for PLMD. Unless the patient or the bedpartner are experiencing negative symptoms of sleep loss or other medical issues due to the nocturnal movements, treatment may not be necessary. The most common form of treatment for PLMD is prescribing the same medications as those for Parkinson's disease, anticonvulsant medications, benzodiazepines, dopaminergic drugs, and narcotics. There is no cure for periodic limb movement disorder and treatment for the disorder must be continued to reduce symptoms. Patients with PLMD should also avoid certain substances that can exacerbate symptoms such as caffeine, alcohol, or antidepressants. If your nocturnal leg movements are causing you or your bedpartner to lose sleep, you may want to consult with your physician or a sleep specialist for diagnosis. At the Alaska Sleep Clinic we specialize in diagnosing and treating a myriad of sleep disorders including PLMD and RLS. If you're constantly moving your legs during sleep and it's causing you problems in your daily life, contact us by clicking the link below and get on your way to leading a healthier happier life.